A new Paper published today highlights how Brexit might change how British businesses engage with EU institutions in order to further their objectives. 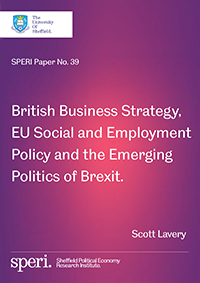 Through a document analysis of business responses to the Balance of Competences Review on EU Social and Employment Policy and CBI policy documents between 2010-2016, the author Scott Lavery outlines how British business has attempted to ‘defend and extend’ a liberalising agenda in the EU throughout the pre-referendum period. It is argued that Brexit fundamentally undermines this strategic orientation. The Paper concludes with some of the key strategic dilemmas which the ‘leave’ vote generates for British capital within the emerging politics of Brexit.